The University of Notre Dame Initiative for Global Development (NDIGD) was recently awarded a $375,000 contract from the Millennium Challenge Corp. (MCC) to conduct an evaluation of MCC’s water project in Ghana. In 2006, MCC signed a five-year, $547 million compact with the Republic of Ghana aimed at reducing poverty through agribusiness development. The University of Notre Dame will help evaluate the benefits of the water component of that project, which was designed to provide water systems to communities in Ghana. Three hundred ninety-two water points were constructed, including boreholes, small town water systems and pipe extensions. The evaluation will help determine whether improving water systems in participating districts has reduced the prevalence of illness — particularly diarrhea — and generated health improvements, and whether beneficiary productivity and incomes have increased with the availability of better water. 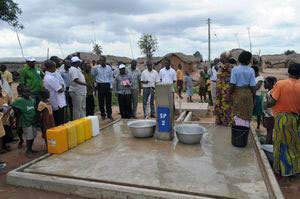 Some 137 selected communities in the intervention areas are benefiting from the improved water systems. NDIGD will work with MCC to evaluate the water activity of these improved water systems, integrating a survey and data collection to synthesize outcomes of the project. NDIGD’s previous experience in using rigorous research methods to collect data from communities will be helpful in designing and executing the evaluation. The research team includes Edwin Michael, professor of biological sciences and a member of Notre Dame’s Eck Institute for Global Health. “We are excited about investigating whether the model used for the water intervention has led to improved health outcomes, particularly in the case of diarrhea, which continues to be a leading cause of death among the developing world’s children,” Michael said. NDIGD monitoring and evaluation specialists Lila Khatiwada and Juan Carlos Guzman will travel to Ghana in December to develop the design for the survey and data collection that will be implemented in 2014. “We are collaborating with several experts in Ghana to assist in providing local expertise and knowledge as we design the study and carry out the evaluation,” Khatiwada said. Economics professor Joseph Kaboski will provide input into the design of the evaluation and assist in analyzing the data. Other researchers on the project, including ND-GAIN research fellow Chen Chen and Andres Martinez, data management consultant for the Center for Social Research, also serve as part of the research team. A United States foreign aid agency created by Congress in January 2004, the Millennium Challenge Corp. is committed to providing smart U.S. foreign assistance by focusing on good policies, country ownership and proven results. Originally published by Hillary Bengtsson at news.nd.edu on November 15, 2013.